The Front-End and Back-End are generally two different LPARs with the communication between them utilizing an event driven processing model. This provides a highly secure, robust and performance oriented environment while at the same time being scalable, configurable and easy to use. 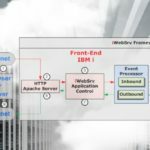 iWebSrv addresses two of the most common obstacles facing the IBM i community today: security and the ability to isolate programmers from the complexities of web application development, freeing them to concentrate on providing users with business information. iWebSrv gives IBM i programmers the tools necessary to easily support web requests without the need for any knowledge of the HTTP server or web complexities — save for the formatting of the response, usually in XML or JSON. Think of it. Customers, suppliers and business partners, all interacting with an IBM i via a web service, getting and exchanging the information they need in real time. And that’s not all! iWebSrv includes a library of templates and sample programs to help programmers get up to speed quickly, without the need to ‘reinvent the wheel’. What can iWebSrv do for me? iWebSrv can get you up, running and supporting web-based business application data and information requests in no time at all. iWebSrv’s purpose is to help you leverage your legacy system databases to support web requests and give you tools to develop web applications that offer greatly enhanced data acquisition, exchange and distribution processes. The following diagram provides an overview of the components employed by iWebSrv and their interaction.